This rich casserole needs very little preparation before it is left to cook. The beef will emerge from the oven beautifully tender and succulent. Serve with the baked mushrooms cooked alongside the beef and a generous helping of mashed potato. Preheat the oven to 170°C, gas mark 3. Heat 2 tablespoons of oil in a medium flameproof casserole and fry the beef in batches until browned all over. Return all the beef to the casserole and stir in the onions, capers, anchovies, stock, mustard and half the parsley. Press a piece of damp greaseproof paper down onto the surface of the mixture, then cover tightly with foil or a lid. Place the casserole in the oven and cook for 1½ hours. Place the mushrooms on a baking sheet. Season to taste with salt and freshly ground black pepper, then drizzle with the remaining oil. 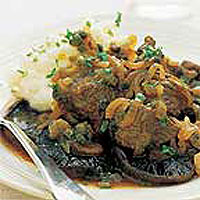 Return the beef to the oven and place the baking sheet with the mushrooms on the shelf above the casserole. Cook for 30 minutes until both the mushrooms and beef are tender. Meanwhile, heat the mashed potato according to the pack instructions. Sprinkle the remaining chopped parsley over the beef mixture and serve spooned over the mushrooms, with the hot mashed potato. Use a casserole that is just large enough to hold the beef mixture. If the dish is too large, the liquid will evaporate too quickly during cooking. Wash hands, equipment and work surfaces thoroughly after handling raw meat.